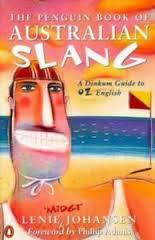 Many of you know that Australia has some of the most comprehensive and colorful English slang on the planet. 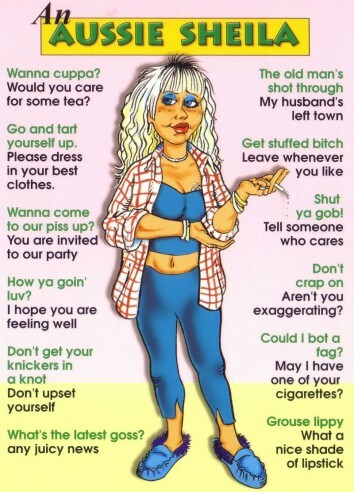 I have been told, that especially in the last few generations the slang was so deep, that native english speakers from other countries could easily be lost in conversation even without the accent difference. 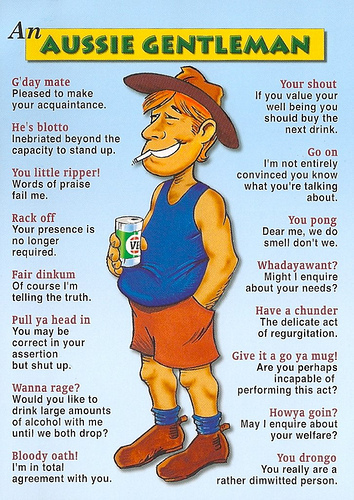 While much of this has been lost due to the multiculturalism, and dare I say…the need to be understood, country folk (and some really patriotic Aussies) still use a ton of the phrases similar to what you see here below. I have acquired a translation book that helps me to understand this foreign language. Don’t be fooled. This dictionary is 500 pages long! However, since the language is alive and well and continues to move, you can generally follow this rule of thumb to make anything sound a little more Australian. Abbreviate everything, especially with an O at the end. Aussies don’t like to use more than two syllables per word. They also don’t seem to like Acronyms. A/C is AirCon. AC/DC is acca-dacca. I am working on a telling a story in Aussie slang and I invite you to share! 1) Please send me your best and most favorite Australian phrases and words. They can come from anywhere, so long as an Australian was involved. 2) Since Aussies are so keen on their dialect, and admit a love for it despite how little of it is used anymore, I thought us North Americans might add a few to their collection in hopes to revive it a bit. Below are a few of my suggestions. Do you like those? I’m sure I’ll come up with others. Let me hear yours! All those completing these assignments get a mention in my upcoming play (if they want it).